Melissa Puryear purchases $21.00 worth of gas at Circle K on Oak St. in Bakersfield, Ca. Bakersfield is already seeing an increase in gas taxes from last year’s gas tax hike, and may be set to see more taxes in the coming years due to a federal gas tax and a local sales tax increase in its preliminary stages. Already California ranks 6th in the nation for gasoline taxes. The national average according to the American Petroleum Institute (API), is 51.73 cents per gallon; That is if Congress approves a federal gas tax hike to repair infrastructure, roads and bridges, and if city residents support council members’ potential proposal for a local sales tax increase. Although California’s rank sits fairly high on the list of gasoline taxes for 2017, at 71.89 cents per gallon, the Golden State was not alone. 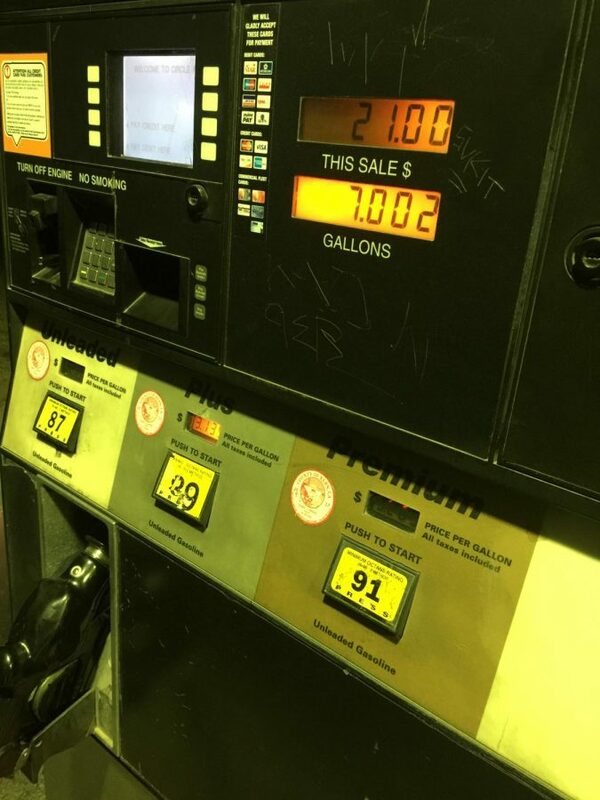 Pennsylvania leads the gas tax at 77.10 cents per gallon, followed by Washington at 67.80 cents, Hawaii at 64.43 cents, New York at 62.70 cents, Michigan at 60.78 cents, and Connecticut at 57.70 cents, according to APIs gas tax graph. For Bakersfield, last November’s gas tax hike, signed into law by Governor Brown to address the widening gaps between infrastructure repair and California’s lack of financial revenue coming in to address the repair needs, may now be added to President Donald Trump’s proposal to legislators, that a federal gas tax is needed to fund infrastructure repair needs across the nation, a federal gas tax that hasn’t seen a facelift since 1983. This would mean that locals may see an even greater number of their dollars going to taxes in the months and years ahead, dollars which they may feel are being squeezed from their pocketbooks, given the most recent gas tax hike in November, in California. His solution to road repair, is to see results and responsible management of taxes being paid for the gas tax. As far as potential increase in local sales tax, he said that the expense is unnecessary and that he believes council members are seeking to raise taxes to serve their special interests. If he has to pay increased gas taxes and sales taxes, he wants those taxes to be used for what they are intended to be used for. Another commuter, BC counselor, Jonathan Shultz, 30, said he pays approximately $350 for gas each month. With two young children and a stay-at-home wife, any additional out-off-pocket expense for gas taxes is a concern. With commuting costs going up by $50 with the gas tax hike in November, he is concerned that another increase could push his bill upwards of $400. It appears of the Americans that were polled by Gallup last year, they would agree with Miles on the federal gas tax increase to improve roads, bridges and infrastructure spending. Americans largely supported Trump’s federal gas tax that “calls for $200 billion in federal spending over the next decade, combined with $1.3 trillion in funds from state and local governments, as well as private partners,” according to the poll. If the federal gas tax is approved, it would raise a gallon of gas by 25 cents. The plan would increase the taxes on each gallon of gas at .05 cents, each year, for the next five years.